This was literally our longest day. We knew it was a long hike, and we also knew the drive could take quite a while (it was easier than expected, but just about the right time allowance on the way out). So, for once, we got up and raced out the door like typical Moab visitors. We're actually about halfway to the dome here, and the warped mass you see in Photo Center is the outer rim of the main shock ring. In fact, if you go back one page and look just above the right side of the sign, you'll see the same formation from the starting point. For those who have FatBits or xmag or anything that can enlarge part of a photo, aim it slightly left of center just below the middle of the dip in the shockring rim -- it's definitely alien territory! 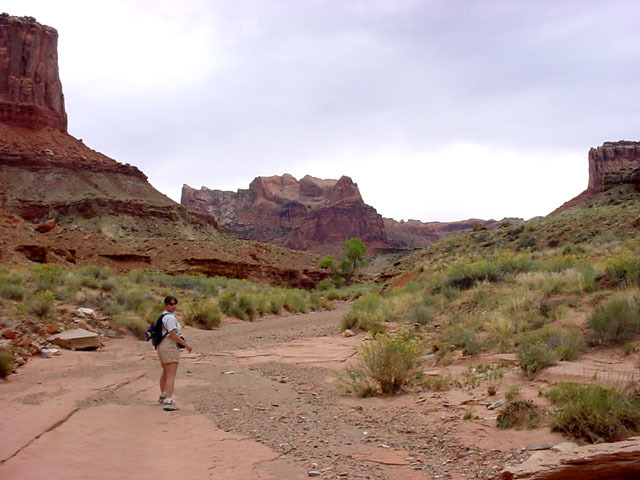 Note, however, that topography at this point is still normal canyonlands.